Fall in Chicago is a special time of year. The amount of time we have beautiful, brisk weather perfect for wearing cozy, chunky sweaters is limited as winter and summer fight over the milder season. The trees turn colors and the streets line with leaves of yellow, orange, red and brown. It feels magical and surreal at times that a city could be so gorgeous. If you’re visiting from out of town, hopefully you get to experience one of the more brisk days (like today). Experience what it's like to bundle up while roaming the streets of the Windy City. Whether you’re looking for a comforting bite to eat, need to warm up, or ideas for things to do...we’ve got the ultimate list for fall. Considering we just had our first snow this weekend, I wouldn’t wait to long to enjoy what’s left of the season! My friends and I went to True Food Kitchen for our latest girls’ night and it was nothing short of spectacular. The food was phenomenal and the service top notch. The restaurant is larger than it looks and has a fresh, modern, California vibe to it. The food is health conscious and seasonal but the use of ingredients will hardly have you missing all the fried, gross stuff. My friend and I split the Fennel Chicken Sausage pizza with a gluten-free crust and the Turkey Burger. Both were amazing and we all decided we want to go back again. It’s feel good food without the guilt and not terrible on the wallet which is always a nice perk. Pinstripes is one of those restaurants you don’t have expectations for but are blown away by. For starters, the River North location features food, bowling and bocce ball making it a great spot for when the weather is too miserable to be outside. They have one of the best happy hour menus with a decent list of drinks and food including whole pizzas, sliders, appetizer platters, and more. You can get used to the happy hour menus where you have to order ten of one thing just to stop feeling hungry. Pinstripes stands out by offering hearty, satisfying options. Not heading over during happy hour? No worries. Their menu is full every everything from pasta to pizza to salads and they even have a gluten-free menu that’s not too shabby either. The gluten-free pizza crust is ah-mazing! Take Advantage of Free Museum Days! Many of the museums around Chicago have a few days each month with free admission. Adler Planetarium has free admission for Illinois residents October 24, 25 and November 11, 12, 14, 15. The Field Museum (my favorite) has free admission for Illinois Residents October 28, 31 and November 11, 18. The Museum of Science & Industry doesn’t have any free days in October but Illinois residents can head over on November 12th for free admission. The Art Institute has free admission every Thursday for Illinois residents from 5-8PM and the Chicago History Museum is free for Illinois residents Tuesdays between 12:30 and 7:30PM. One thing you can always count on during fall in Chicago is the inevitable number of rainy days. The gloom is real and sometimes that can ruin a day. The good news is that the rain usually comes in bursts so while it might be raining in the morning, it’ll dry up by the afternoon or vice versa. Broadway in Chicago has several amazing shows coming through this season. Hello, Dolly! will be in town from October 23rd - November 17th at the Oriental Theatre, Miss Saigon begins November 13th at Cadillac Palace Theatre, The Book of Mormon begins on November 20th at the Oriental Theatre, and of course Hamilton is always playing at the CIBC Theatre. If you’re looking to fill an afternoon or evening last-minute, try the box office of any of these theatres the day of for last-minute tickets. Sometimes you can score really great seats! 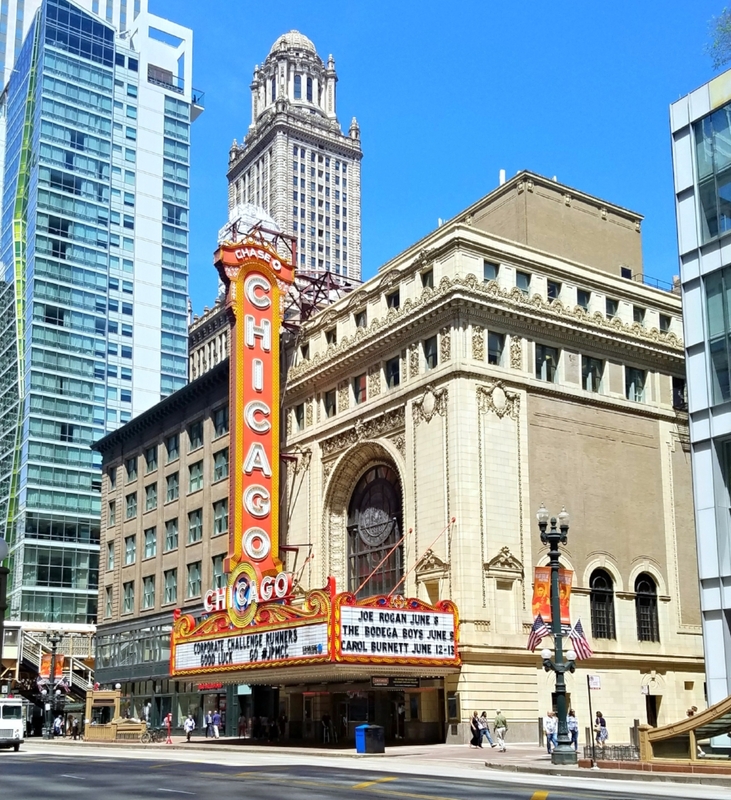 The Chicago Theatre also has shows regularly. Make sure to check out their line-up and ticket availability as well. Pumpkin Patches, Apple Orchards & More! Being in the Midwest, Chicago has its fair share of farms to visit. In fact, we’re a little fall-obsessed around these parts so it would be hard not to run into a pumpkin patch at least once. While there are several pumpkin patches within the city, it's worth venturing outside the city for. The suburbs and outlying towns have a variety of options to choose from for both pumpkin patches and apple orchards. Some apple orchards will also have fun Halloween and fall activities so you can get the best of both worlds. Make sure to grab some apple cider, apple cider donuts, apple butter, pumpkin butter...the works. I can’t resist all the delicious fall flavors and why should we? Well...sort of. Graceland Cemetery on the north side of Chicago is known for a few things. For starters, it’s absolutely gorgeous especially in the fall. It might sound weird but it’s actually a popular photo spot. Because many of Chicago’s rich and famous were buried here, the grounds have been expertly crafted and well-maintained. Second, there are rumors it’s haunted which is perfect for this time of year. While it’s unlikely you’ll come into contact with Daniel Burnham’s ghost, you will come into contact with gorgeous photo opportunities of the fall foliage and architecture. Depending on where you are in the cemetery, it can feel serene and ethereal or a bit creepy. It’s all part of the experience though. Fun facts? Myths, actually. There are two other cemeteries in Chicago that are rumored to be haunted. To discourage actually visiting them, I’ll refrain from sharing their names but if you’re a local, you know the spots I’m talking about. For cemetery #1, the story says that a girl who was murdered on her prom night can be found walking along the side of the road near the cemetery she was buried. For cemetery #2, rumor has it that the mob used to dispose of bodies in the pond. Supposedly, you can see their faces staring back at you while looking into the water. The same spot is known for glowing balls of light and a mother sitting on a tombstone weeping for her buried infant daughter. If you do happen to Google either of these cemeteries and figure it out, I strongly discourage visiting them especially during this time of year unless you have a loved one buried there or have permission. Clearly, things have gotten out of hand over the years (thanks, teenagers).